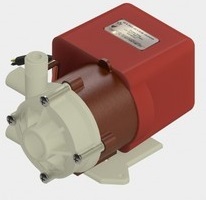 AC-5C-MD March Orbital Magnetic Drive Pumps eliminate the conventional shaft seals found in most pumps. This means that there is no rotating seal to wear and allow the liquid being pumped to leak out. The pumping action may eventually fail, however the liquid can never leak out. 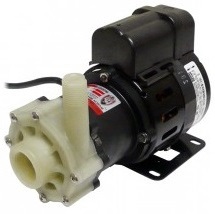 The Model AC-5-MD has an open air fan cooled, moisture protected motor, allowing the pumps to be run continuously. Pumps are not self priming and will not produce a suction lift and must be installed with a positive flooded suction. We rely on the liquid being pumped to lubricate the impellermagnet assembly spinning on the stationary spindle. The pump is not to run dry . LC-3CP-MD March “Orbital” Magnetic Drive Pumps eliminate the conventional shaft seals found in most pumps. This means that there is no rotating seal to wear and allow the liquid being pumped to leak out. The pumping action may eventually fail, however the liquid can never leak out. 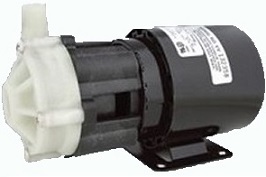 The Model LC-5C-MD pump can be run totally submerged or can be run in open air for complete moisture protection. Models are 230 Volt, 50/60 Hz, 1 phase, A.C. 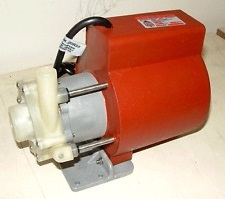 The motors are thermal overload protected, and the motor and overload combinations are U.L. and C.S.A. listed. All cord sets are U.L. approved 18/3 wire, SJO or SJT cords.